The entire Camden County College community applauds the accomplishments of the Class of 2019 and extends congratulations for the successes that have brought its members to graduation and the College’s 51st Annual Commencement. This year’s ceremony will be conducted at 10 a.m. Friday, May 17, 2019, in the Truman Courtyard of the Blackwood Campus. The campus is located at College Drive and Peter Cheeseman Road in Gloucester Township. I look forward to seeing you and extending my personal congratulations. *August graduates who wish to participate in the May 2019 Commencement ceremony must submit complete packets to the appropriate academic dean by March 15 in order for their names to be printed in the Commencement program. Schedule a meeting with your Program Coordinator or an Academic Advisor to review the Graduation Application. Have your Program Coordinator or an Academic Advisor complete and sign the Graduation Recommendation Form. Sign the Graduation Recommendation Form. Get a copy of your current CCC transcript and degree audit from your Program Coordinator or an Academic Advisor and attach it to the Graduation Recommendation Form. Provide the Program Coordinator or Academic Advisor with a copy of the completed forms. Hand-carry the completed packet to the office of the appropriate Academic Dean by the deadline. Camden students may leave their forms in the Administrative Office on the second floor of College Hall. Rohrer students may leave their packets at the Information Desk. Your attendance at rehearsal is strongly suggested. Rehearsal will be held Thursday, May 16, 2019 at 10:00 a.m. Graduates will assemble under the commencement tent. Please be prompt. Transportation to the rehearsal will be provided between the Camden City and Blackwood Campuses. A van will depart from Camden City Campus at 9:15 a.m. and return to the Camden City Campus upon completion of the rehearsal. Sign up at the Camden Technology Center, Room 211, or call (856) 968-1320. If a final exam prevents you from attending the commencement rehearsal, please arrive in the Papiano Gymnasium by 8:30 am on the day of commencement. Graduates: Your participation in the commencement ceremony is greatly encouraged, even though you may have already received your diploma. If you plan to participate, you are required to wear a cap and gown. The cost is $41.00. Students may pay by cash or major credit card, no checks will be accepted. Caps and Gowns will be available for purchase at any of the three campus bookstores beginning April 9th. Graduates who are members of honor societies are permitted to wear ornamentation designated and approved for their specific honor society. Please check with your Honor society advisor for the specific items that have been approved as commencement attire. Commencement is a dignified occasion. We ask that those attending the ceremony conduct themselves in an appropriate manner. The College community appreciates your cooperation. We ask graduates to report to the Papiano Gymnasium. 8:30 – 9 a.m. 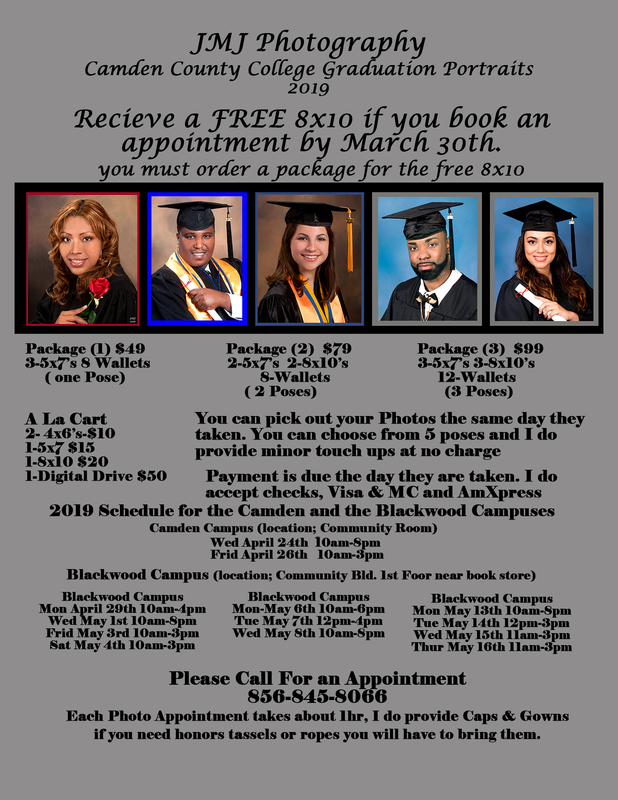 Check in and pick up your graduation ID card. 9:30 a.m. Graduates line up by academic division. Signs will be posted in the gymnasium. Graduates will recess to the Presidential Courtyard. Please ask your family and friends to meet you in that area after all the graduates have walked out of the event tent. Graduates may decorate their caps with personal messages. Interested in becoming the 2019 Student Speaker at Commencement? The CCC Alumni Association is a vital link between the College, its alumni and the community it serves. As you graduate, you join the ranks of more than 30,000 graduates who claim Camden County College as their alma mater. Membership in the alumni association is free and provides special benefits for its members. For more information about the association, contact Myra Tryon in the Office of Foundation & Alumni Relations at (856) 227-7200, ext. 4927. Eligible academic year 2018-2019 graduates (August 2019, December 2018, and May 2019) may be considered for election to the College Board of Trustees as a non-voting member. 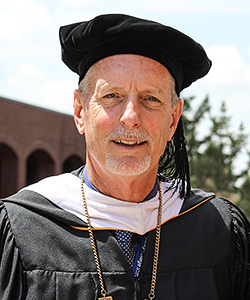 The Alumni Trustee serves a one-year term of office beginning in September of each year. Recommendation by a College faculty member or administrator. At commencement rehearsal you will be asked to vote for student who was nominated for this privilege. Candidate information, voting deadlines and voting instructions will be available on this page. At the commencement ceremony, diploma sleeves will be distributed instead of diplomas. You will be notified via postcard when to come to the Office of Admissions, Records and Registration Services to pick up your actual diploma (on or about August 15). Diploma covers and diploma frames will be available for sale in the College bookstores and at the commencement ceremony bookstore sales tent. For a donation of $25 to the 2019 Class Gift, you can pre-order your own copy of the 2019 commencement DVD. Contact the Office of Foundation & Alumni Relations for more details at (856) 227-7200, ext. 4927, or mtryon@camdencc.edu. No tickets are required. General, unreserved seating for guests of graduating students is available on a first-come, first-served basis under and surrounding the event tent. The ceremony will be simulcast inside Civic Hall, located in the Connector Building. Also, on the day of commencement, look for a link to watch the Ceremony live from anywhere. Due to safety considerations, no backpacks or large bags will be permitted in or near the graduation site in Truman Courtyard. Commencement will be held under a large, weatherproof tent and will not be postponed due to inclement weather. However, should extreme circumstances arise that may cause a delay or postponement, a notice will be made to KYW 1060 AM by 8 a.m. on May 17. The best place to obtain an update on the ceremony is on the College website. The College’s main phone number at (856) 227-7200 also will carry updated information. Download the invitation to print and/or share with your friends and family. For your convenience, the Barnes and Noble college bookstore will be open from 8 a.m. to 12:30 p.m. on commencement day for the purchase of flowers, balloons and other memorabilia. Stations are available in the Papiano Gymnasium and Otto R. Mauke Community Center restrooms. The Connector Café, located in the Connector Building, will be open for business with coffee service and assorted pastries prior to the commencement ceremony from 7:30am till 2:00 pm. In keeping with the formality of this occasion, all cell phones and other similar devices should be silenced. Camden County College is a Tobacco-Free Institution. Use of any tobacco products on College property violates the College’s Tobacco-Free Institution Policy. If you have any further questions regarding Commencement, please contact Jacqueline Tenuto, Assistant Dean of Student Development and Support at jtenuto@camdencc.edu or (856) 374-5088.